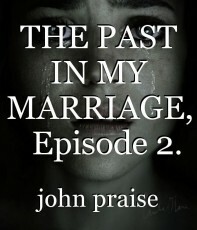 THE PAST IN MY MARRIAGE, Episode 2. TITLE: The Past In My Marriage. I was so confused on what to do or how to go about it. I consulted my friends and they gave me some advice. Juliet suggested I go straight telling him it was over not minding what he would feel or say. So i made up my mind to tell him it was over, and I was getting married to someone else. "Pls tell me it's a joke" Mike said impatiently as if wanting to hear something to cool him down. I acted like I was ignorant to his claim. And I asked what. "Pls tell me you ain't getting married to him" he said again. This time so sadly. I told him I was and explained to him I loved Emeka so badly (even when I knew it was a lie). He couldn't believe his ears, he was staring at me like i was a ghost. His body was shaking violently like he was close to convulsing. His face turned pale like he was drenched in winter, with deep sadness engraved in his soul. "Just move on with your life, like I did too" I've told him. He came back to reality so abrupt like my words cutting through his auricles. He couldn't believe I was saying this. He couldn't believe the same Lady who had loved him so much is telling him to move on. I understood his pains and I began to feel pity for him now. I couldn't believe I was saying or doing all this to him, My own very Mike. The same guy who have loved me flawlessly. My prince charming that was so loyal to me. I wanted to see him smile again, that smile that have always melted my heart. I began to feel a twitch of regret in my soul. I was digressing in my thinking when I heard his voice. As if not hearing him clearly he asked again. "No..I'm not sure" I answered looking away. My heart was broken instantly. I wanted to scream I have loved him and still do. He was still making my heartbeat. I was fighting back tears In my eyes. I was trying to show I was strong but my heart was broken so badly inside. As if I could hear him fighting with his breathe. He spoke the most heartbreaking words to me. "You never loved me but I've loved you so much. I gave my time, strength and everything to make sure you were comfortable. Now you tell me you don't love me. Leaving me in the wind to wallow in pain. A shattered Ecstasy of Agony. Do you even care if....." He could not hold it in. Those beautiful pairs of eyes was flooded with tears. Bitter tears that made him sob aloud. It was too much for me to bear. This is the same man who had been my shoulder when I cried. He met me after I was heartbroken by my ex, and he gave me a reason to smile again. And I paid him back by hurting him so badly. I immediately felt like quitting the marriage, but the "Babe must survive" logic was holding me back. I couldn't say anything. Nothing at all! Just then Emeka showed up. As if he had been looking for me all around. Meeting me with Mike and in an atmosphere like that, his expression was questioning. He told me he had been looking for me and if I was okay. He hugged me, kissed me. And I could see Mike looking like he could not believe his eyes. He asked who Mike was and I gave the most wrong definition of Mike. "He is my Past"... I told Emeka. We both walked away from the scene holding hands. That night Mike called and called. He texted but I didn't reply any. Anytime the phone rang, it's tune cause a quake in my heart. It was hard to accept him as my past. It was hell all through. I could imagine what he would be feeling and how bad I made him feel. I have seen him hurt before but not like I saw him earlier today. The days went by and my wedding was drawing nearer. I was beginning to accept Mike as my past. With the help of Amaka (Emeka's younger sister), I was able to handle everything about Mike. Though I still felt pity for him. But I moved on. At least I was already filing my head with the picture of Emeka. It was finally the deal day. The day to be pronounced 'A woman'. The church bells was ringing already. Emeka was all dressed and he was looking even younger. I was dressed in an all white linen Wedding gown, designed with strips of gold at the helm and chest. All fitted with Scarlet breast push-ups and my bosom appeared heavenly. I was on silver-platted heels, marching ear rings and choker. My appearance could be mistaken for that of Queen Elizabeth ll of England. The marital rites was Indeed romantic. I most confess I was nervous in saying the "I do". It was mind blowing Kissing him after the blessings. The wedding ring was carefully crafted from Diamond, and there were golden inscriptions on it saying " Forever". The wedding ceremony was everything as I ever wish for. So colorful and rich. Dignitaries were flooding in and out. Everybody had more than enough to eat and take home. Lots of gifts and gestures. Our wedding was the talk of the town. It was futured on NTA and popular Entertainment platforms. Indeed it was as i dreamt. So Big! But i never knew that was just the beginning of another life. A phase of life I had no idea about. The ceremony was just a day, but the vows remained forever. It comes with Joy and Pain. I guess that is why it is called "for better, for worst". I thought getting married to a rich and well renowned business man was all it takes to be married. But I never knew fortune was not future. Never knew that was just the beginning!